California’s most southern major city, San Diego is one of the coolest places in America to visit—a city loaded with fun attractions aimed at drawing tourists from around the world. San Diego, with its miles of glorious beaches, is located along the coast of the Pacific Ocean, just a two-hour drive from the city of Los Angeles. As of the last census, it was home to nearly 1.4 million permanent residents, making it the second-largest city in California (after Los Angeles) and the eighth-most populous city in the entire country. San Diego, with an average year round temperature of approximately 75 degrees, is an absolute tourist haven, drawing millions of visitors each and every year. In addition to its wonderful and very enticing climate, San Diego boasts a number of characteristics that make the city attractive to visitors, including white sand beaches, cultural diversity, an awesome night life and hundreds of attractions to see—attractions such as Balboa Park, the Belmont Amusement Park, the San Diego Zoo and Safari Park, Sea World San Diego and so much more. In addition, the city’s Spanish and Mexican heritage, owing largely to its location along the Mexican border, is beautifully reflected in San Diego’s many historic quarters, such as Old Town San Diego State Historical Park and the majestic Mission San Diego de Alcala. San Diego is also considered the “Craft Beer Capital of the World,” as it plays host to an almost astonishing number of microbreweries that produce some of America’s favorite beers. In the following article we will highlight five of the coolest things to do and see while visiting the city of San Diego, including a brief description of these places’ characteristics and an explanation as to why each is so popular and alluring to visiting guests. The San Diego Zoo is generally considered one of the finest zoos in the world, hosting an almost unbelievable number of animals and so much more. From its educational tours to its stunning gardens to the fine dining opportunities available at the park’s Albert’s Restaurant, this popular San Diego attraction literally has it all. Since the early 1920s, the San Diego Zoo has proven itself as a leader in the animal exhibition—and animal care—industry, creating cage-free animal exhibits in surroundings and environments that closely mimics each animal’s natural habitat. Animals of every shape, size and species abound at this well-visited San Diego attraction, including big cats (lions, tigers, leopards, etc. ); monkeys, chimps, apes and gorillas; wolves and foxes; reptiles; fish and amphibians; and almost every species of bird one can imagine, from large ostriches to the smallest tropical bird species. In addition to its virtually inexhaustible collection of animals, the San Diego Zoo is home to several stunning botanical plant and orchid gardens. In fact, the zoo, along with its adjacent Safari Park, also doubles as a “rescue center” for some of the world’s most endangered species of plants. Although well-known for its family-friendly atmosphere, the San Diego Zoo is additionally a great place for a date night or evening out. Albert’s Restaurant, located in the Tree House complex next to the Gorilla Tropics, offers fine dining and a full bar, and is recognized as one of the city’s finest dining establishments. The restaurant is open for lunch and summer evening dining, and includes an outdoor seating area that overlooks a cool and refreshing waterfall. The San Diego Zoo is home to a number of unique and trendy shops where guests can pick up a souvenir or two; and because the facility rents equipment such as strollers and power wheelchairs, it can be equally enjoyed by everyone in your group. If you plan to visit San Diego for a few days, you should definitely make your way to 849 West Harbor Drive, where you’ll find the city’s renowned Seaport Village. A fun and interesting mix between an outdoor bazaar and an art and wine festival, this superb San Diego attraction is a must-visit when staying in the city. The first thing you’ll probably notice with regard to Seaport Village is the attraction’s incredible size. Boasting some 14 acres, the site is loaded with unique shops and trendy boutiques, fine dining establishments and seasonal live music and entertainment. The entirety of Seaport Village is virtually impossible to visit in a single day, but its seaside location makes it the perfect family getaway. All the enjoyment of this great attraction is just close enough to downtown San Diego to make it easily accessible, yet far enough away so as to escape the smog, crowds, and the hustle and bustle of the city center. Open daily from 10:00 AM to 9:00 PM (some restaurants at the site have extended hours), Seaport Village is also a great place for children of all ages. Among other features, this enjoyable extravaganza hosts a colorful carousel, caricaturists and tasty bakeries serving up sweet treats kids will love. Come nightfall, couples can make their way to one of Seaport Village’s many bars, restaurants and/or night spots, each offering delicious cocktails, world-class and delectable cuisine and non-stop dancing and entertainment. Another bonus associated with Seaport Village is the daytime entertainment featured at the site. Every day, from 12 PM to 4 PM, Seaport Village San Diego features live music entertainment in the Food Court, with bands representing a diverse variety of musical styles and genres. Whether you prefer rock music, jazz, pop, country or even Mariachi and Flamenco music, Seaport Village is a great place to find it. Finally, after a long weekend soaking up the San Diego sun, Sundays at Seaport Village provide guests with a fine opportunity to relax and unwind while taking in one of the many free concerts offered at the site’s outdoor pavilion. Simply put, if you enjoy shopping, snacking, fine dining, entertainment and endless sunny days, Seaport Village is definitely the place to be. Perhaps one of the most family-friendly locales in all of San Diego, Balboa Park is a wonderful place to visit regardless of the season. 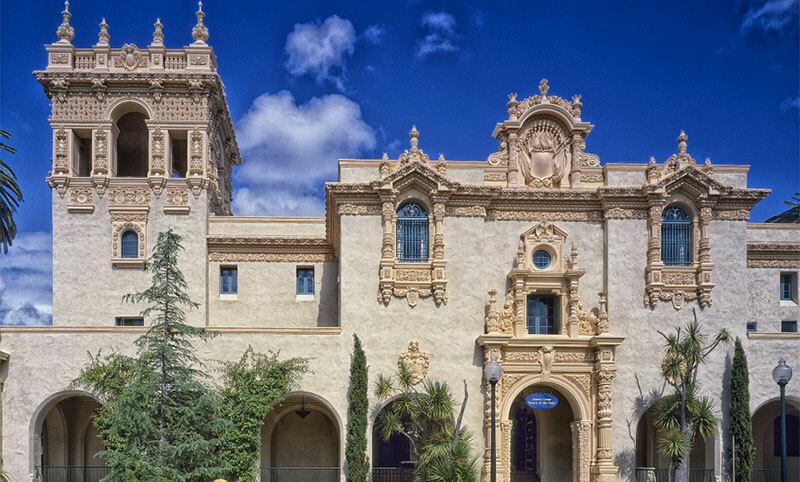 From its wide variety of museums to its vivid gardens to the vast array of fair-style rides for the kids, Balboa Park is an attraction that is sure to please everyone in your group. Originally known as “City Park,” construction on what is now Balboa Park actually began way back in 1892, when the first bit of landscaping was added to the northern end of the park. Over the years, the park has continued to evolve and improve and has now become one of San Diego’s most popular spots for locals and visitors alike, drawing millions of guests each year from around the globe. Centro Cultural de la Raza—a great place to immerse oneself—and become educated about—the art and culture of the Mexican, Latino, Chicano and Indigenous people. Mingei International Museum—a museum with a wonderful array of local folk art. Museum of Photographic Arts—a grand hall highlighting thousands of images caught on camera. Museum of Man—a museum featuring relics and artifacts that demonstrate the progression and evolution of man since the beginning of time. The Botanical Gardens building at Balboa Park will utterly thrill the nature lovers in your group. According to the park’s website, the building plays host to 2,100 permanent plant exhibits and an ever-changing collection of cycads, orchids, ferns and palms. In addition, the California Native Plant Garden at Balboa Park showcases thousands of domestic plant species that are native to the state. There are many amusement park-style rides for kids visiting Balboa Park, including a hand-carved Merry-Go-Round and a miniature railroad that takes guests on a brief tour of the park—a ride that covers roughly 4 acres. Of course, Balboa Park also features a great number of terrific restaurants and snack-based eateries, where families can rest and refuel from their busy sightseeing schedule. Located very near the aforementioned Seaport Village, the San Diego Maritime Museum is undeniably one of the coolest attractions to visit in the city of San Diego. The museum, which is located at 1492 North Harbor Drive, is open every day from 9:00 AM to 8:00 PM, and guided tours are available upon request. The San Diego Maritime Museum, as the name suggests, features historic ships that make up the museum’s permanent and temporary exhibits. Getting to board some of these ships is a real treat, as guests have the unique opportunity to see what life was really like for sailors aboard these ships. Not only does the tour take visitors to the helm and control rooms that are responsible for propelling these ships of the past, it also allows them to peek into the actual quarters where the crew would sleep, the tiny bathrooms and showers where they would clean up after a long day, and even the kitchen and mess hall where sailors would prepare and take in their meals. In totality, the tours of these ships symbolize a one-of-a-kind opportunity to study some of the nuts and bolts of naval life and the maritime experience. One of the coolest things to do when visiting the San Diego Maritime Museum is to take part in the “Adventure Sail.” This exciting outing, spanning four hours from start to finish, is a superb chance to actually experience the thrill of a real sailing ship. During this sailing excursion, and with the help of the San Diego Maritime Museum staff, guests will take part in a genuine “line-haul,” man the helm of the ship and experience an actual cannon salute. Ships at the San Diego Maritime Museum include sailing vessels, tankers and even submarines. One of the highlights of the tour is the HMS Surprise exhibit, a scaled down representation of the 18th century Royal Navy frigate nicknamed “Rose,” one of the most famed ships in the history of the British Royal Navy. Considered the heart of the San Diego nightlife, the Gaslamp Quarter is the place to be in the city once the sun disappears into the vast Pacific Ocean. Frequented by locals and visitors alike, the neighborhood is home to some of the city’s trendiest restaurants and nightclubs, and was recently voted one of the country’s finest quarters for adult-themed entertainment. The Gaslamp Quarter covers roughly 16 square-blocks and is characterized by majestic Victorian-era buildings that are counter-balanced by modern skyscrapers. In addition to its restaurants, pubs and nightclubs, the neighborhood also hosts a number of great retail stores and boutiques, as well as some rich cultural offerings that include theatres, art galleries, symphony halls, concert venues and museums. Although known for its nightlife, the Gaslamp Quarter is also a great way to spend a family day. Sightseeing while admiring the beautiful architecture and shopping at the multi-level outdoor mall known as Horton Plaza are just a couple of the activities that are popular in this neighborhood. Some of the structures in the quarter additionally offer a wide variety of educational opportunities, such as the Gaslamp Museum at the Davis-Horton House, the New Children’s Museum, and the U.S.S. Midway Museum. Dining options in the Gaslamp Quarter range from formal to informal, and include many choices for sidewalk style al fresco, oyster shooters at the rooftop lounge, or in an intimate and ornately designed restaurant that is as tasty as it is elegant. Gorgeous views of the massive San Diego harbor and bay are just another bonus associated with this very popular and heavily-trafficked quarter.